Remember how when you were a kid and used to save up pennies in a piggy until you finally realized that a hundred of them would only get you a bag of chips and paper money was worth tons more? That revelation may have stopped most people from collecting pennies, but in today’s harsh economic climate that money saving mentality can mean the difference between waiting in a breadline or still being able to afford to buy your own meals. It doesn’t seem to matter what industry you’re in; even the legal industry *gulp* is taking a hit. Cutting back and saving money is the only way we’re going to make it out of this recession. That said, sometimes certain expenses can be unavoidable, such as a traffic ticket. In situations like these you have to just bite the bullet and write the check, right? Wrong. As the recipient of numerous traffic tickets ranging from parking violations to speeding tickets and everything in between, I’ve only had to ever pay a small fraction of them. What’s my secret? It’s pretty simple actually. Fortunately for you, I’ve gathered my years of experience in a handy guide below. Before tearing into it however, you should note that these steps won’t always work. It takes time, patience, and a little social engineering, but if you’re diligent you can get those tickets waived. So you’ve just been pulled over for X traffic offense, the first thing you have to remember to do is be polite to the officer. Listen to his or her directions, take off your hat and/or sunglasses, answer the cop’s initial information questions, and never ever get into any kind of fight with the cop. The reason this is important is because no one wants to help out a jerk. At this point the cop hasn’t written a ticket yet and often won’t until he or she tells you what you did wrong. They have the discretion to let you off with a warning, so be nice and they might do so. After the initial information gathering stage, the officer will usually run down what you did wrong, if they don’t do this, don’t be afraid to ask why you were pulled over. Remember to be polite though. If however you know you broke the law, don’t be afraid to admit it. Traffic violations aren’t the same as other crimes and cops have a lot of leeway on deciding whether to let you off or not. If you did something wrong, say that you did and sincerely ask for mercy and let them know you’re not taking this lightly. If you didn’t then don’t be afraid to ask clarifying questions so that you can explain to the officer what actually happened. For speeding violations, it’s also a good idea to ask if you can see the reading on the officer’s radar gun and also when they actually clocked you. Don’t be pushy if the cop refuses, however, just let it pass and try to go for mercy. If you still get a ticket, just take it and leave without making a scene. The less the cop remembers about you the better. Remember, no one wants to help a jerk, but they sure as hell don’t mind making life worst for said jerk. 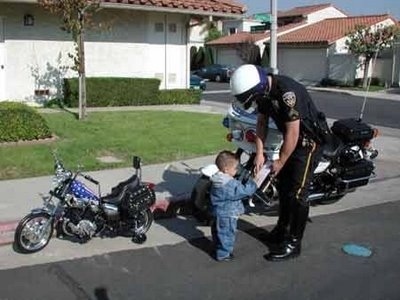 Now that you have the ticket, the next step is to try and meet with the officer again. He or she still retains the authority to dismiss the ticket. So get your bearings, develop a clear and concise explanation for your actions and why your ticket should be dismissed. Then call up the cop to set up a meeting time. Usually cops will meet with citizens if asked, but if they don’t and even if you did, be sure to follow up with a written letter to the cop pleading your case. Try to keep them no more than three pages long (I usually try to keep it at two). If the cop doesn’t let you off, try these same tactics with the judge and prosecutor assigned to your case. This may sound a little intimidating, but remember they’re just people. Worst comes to worst they’ll simply refuse your request. In which case, don’t turn into a stalker, wait for your court date and go in prepared to plead your case yet again. Depending on your state’s laws, some allow alternative punishments to be given out instead of a ticket. This can be anything from attending traffic school to even public service. Check with the court clerk to see if there’s anything you can do to keep your ticket from getting on your record. Also, don’t be afraid to ask for a continuance for your court date. If you can’t make it, get it rescheduled. Doing this may also have the added benefit of putting your matter further into the back of the cop’s mind, which may ultimately be a good thing if he or she can’t remember exactly why they gave you a ticket in the first place. Meet with the cop and prosecutor, and prepare a defense. I shouldn’t have to tell you this, but when you plead guilty to any offense, that pretty much seals your fate right then and there. So remember to plead not guilty. Before your trial begins, try and talk to the cop and/or prosecutor one last time to see if you can get your ticket dismissed or seek an alternative punishment. If this doesn’t work go to trial and be prepared to explain yourself fully and clearly. If you win, great, if not then, well, you have to pay for your ticket. You can also appeal your case if you lose, but only if you think your chances of winning are actually good. Appeals are expensive and doing so may only be a diminished return at this point. Have any of you out there ever fought a traffic ticket and won? Feel free to sound off with your stories and tips in the comments section. « Commit Murder, Inherit a Fortune? Parking ticket. I received a parking ticket in NYC on 1-6-2003. This is over 7 years old. A collection agency representing City of New York is trying to collect $52.66 from me. Am I obligated to pay this after 7+ years and what should I do? I can’t give you a definitive answer of any kind since I’m not familiar with your case (especially because I’m not familiar with New York laws or statute of limitation), but I can tell you typically what happens in situations similar to yours. Typically if you’ve been assigned debt of any kind you’re obligated to pay for it until you can prove otherwise, e.g. it was assigned to you in error, you’ve already paid for it, etc. If you’ve already tried doing what I’ve recommended in my post, you may want to consider consulting an attorney who can help you. Good luck! i got pulled over because I went through a yellow light and when I asked why he was pulling me over, he said that I almost ran a red light. How do you even almost do that? He gave me a ticket but I’m confused on what to do. Can anyone help? This article is spot on. Its all about the money. I am so glad you posted this information. I just got my third traffic ticket in Edmonton last night, and I know if I don’t fight it then I could risk having my license suspended. I was wondering if you have any other tips for me, and if you think I should hire a lawyer or not?